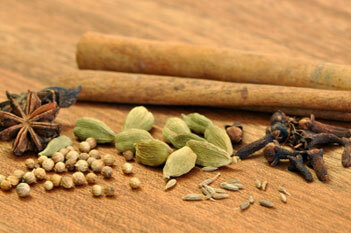 Herbs and Spices are the cornerstone of any dish. Understanding how to use these and the complexity of flavors each adds can make or break a dish. Herbs are more delicate and fragrant than spices and should be used fresh whenever possible. They can be added in at the beginning of cooking to add flavor, but will lose aroma over time. Adding a little more at the end of cooking will add the aroma back in. Spices tend to be more hearty and intense, and store better than herbs. Do not overuse herbs and spices, however, as they can destroy a dish as easily as they can accentuate it. Keep in mind, less is more. In addition to flavor, herbs and spices are nature’s little medicine cabinet. They all contain essential oils which have therapeutic qualities. Although they are not as concentrated as pure essential oils, they still have profound effects on our immune system and overall health. Including these into our regular diet helps to prevent disease and maintain good health along with adding some great flavors to your food. Please note that you should not self-treat with these powerful herbs, spices, or their corresponding essential oils. The therapeutic properties listed are in reference to the herbal properties and/or essential oils contained within them. If you are interested in their medicinal healing properties, please see a certified aromatherapist or herbalist and consult with your doctor (see the Essential Oils page for more information). I try to use fresh herbs and spices whenever possible (denoted with *). I either buy them fresh from the store or grow them in my garden at home. If I can’t obtain them fresh I use dried herbs and ground powders instead, although flavor is greatly diminished this way. For some spices that come in seed, pod, or dried berry form, I prefer to buy them whole and grind them myself as needed (denoted with ~). Some require a spice grater (denoted with >). Always store herbs and spices in a cool, dark place away from sunlight and moisture. I find glass bottles with a rubber seal to be the best. Only keep as much as you can use in 3-6 months to avoid mold contamination and loss of potency. Culinary Uses: Berries are used in Jamaican and Mediteranean dishes. Therapeutic Properties: Antiseptic, analgesic, anesthetic. Helps with circulation, muscles and joints, fatigue, muscle cramps, rheumatism, stiffness, bronchitis, digestive cramps, indigestion, nausea, flatulence, depression, tension, and stress..
Culinary Uses: Peppers are used in Mexican, Latin, and Southwestern dishes. Can be used fresh or dried. Dried peppers can be ground or used to make a paste. Therapeutic Properties: The active oil in all Chile peppers is Capsicum which is known to stimulate the digestive system and helps to reduce cholesterol. It is also used topically (highly diluted) to treat chronic pain. Caution must be used as the oil directly from chiles is highly concentrated and can burn your skin and eyes. Always use rubber gloves when handling them. Therapeutic Properties: The active oil in all Chile peppers is Capsicum which is known to stimulate the digestive system and helps to reduce cholesterol. It is also used topically (highly diluted) to treat chronic pain. Caution must be used as the oil directly from chiles is highly concentrated and can burn your skin and eyes. Always use rubber gloves when handling them..
Culinary Uses: Used in Asian, French, Mediterranean, and Italian dishes. There are many types of Basil. Therapeutic Properties: Regulates the nervous system, balances the digestive tract, anti-inflammatory, overall strengthening. Also used for muscular aches and pains, gout, and respiratory problems. Culinary Uses: Fresh or dried leaves used in French, Mediterranean and Italian dishes. Often used in tomato based dishes. Should be used whole and removed and discarded prior to serving. Therapeutic Properties: Antibacterial, antiviral, antifungal, expectorant, immune support, helps with lymphatic congestion. Culinary Uses: Basic seasoning for all dishes. Therapeutic Properties: Powerful antiviral agent and expectorant. Helps stimulate digestive glands, deficiency of liver and digestive tract, bronchitis, and rheumatism. Culinary Uses: Traditionally used in German and Slavic dishes. Particularly used in breads, cakes, and cheeses. Goes well with meats and root vegetables. Therapeutic Properties: Antimicrobial, anti-parasitic, antihistaminic. Liver and gall stimulant, tonifies spleen, remedies sluggish digestion and bloating, mucolytic. Culinary Uses: Indian and Mediterranean dishes and beverages. Therapeutic Properties: Tonifying, stimulates heart and digestion, helps with cramps, stomach ache, sluggish digestions, diarrhea, lack of appetite, bronchitis, and is balancing after emotional upset. Culinary Uses: Jamaican, Cajun, and Southwestern dishes. Culinary Uses: French dishes. Particularly in salads, soups, sauces, and breads. Therapeutic Properties: Antiseptic, helps with digestion, stimulates metabolism. Also helps with eczema, slow healing wounds, gout, and arthritis. Culinary Uses: Mexican, Latin, and Southwestern dishes. Culinary Uses: Basic spice for desserts and beverages. Also used in Cajun and Jamaican dishes. Therapeutic Properties: Strongly antibacterial, antifungal, antiviral, antiseptic. Helps digestion of protein. Culinary Uses: Used in desserts, Jamaican, Cajun, Mediteranean, and Indian dishes. Use sparingly. Therapeutic Properties: Antibacterial, antiviral, antiparasitic, helps with acute and chronic infections, degenerative diseases, and leaky gut syndrome. Caution: dermocaustic skin irritant. Culinary Uses: Central American, Indian, and Italian dishes. Goes well in tomato based dishes. Therapeutic Properties: Antiviral, antifungal, antibacterial, Mental and digestive tonic, helps with dysfunctions of the digestive tract, weakness, fatigue, flatulence, poor appetite, and loose stools. Culinary Uses: Mexican, Latin, Mediterranean, and Southwestern dishes. Therapeutic Properties: Antiseptic, antibacterial, antispasmodic, diuretic. Helps with colic, sluggish digestions, and dyspepsia. Culinary Uses: Indian, Jamaican, Cajun, and Asian dishes. Therapeutic Properties: Anti-inflammatory, aids in digestion, lowers cholesterol, and reduces the risk of cancer and other pathogenic and chronic diseases. Culinary Uses: Used for pickling or adding a tart flavor. German and Slavic dishes. Therapeutic Properties: Mucolytic, antiviral, antiseptic. Helps with bronchitis, liver and gall deficiency, flatulence, weakness of the heart, and sluggish digestion. Culinary Uses: Desserts and Indian dishes and beverages. Also used in Italian and tomato based dishes. Therapeutic Properties: Antiseptic, anti-inflammatory, antimicrobial, diuretic, antispasmodic, analgesic, expectorant. Releases cramps, helps with deficiencies of gall, liver, and digestive tract, asthma, bronchitis, gout, and supports the kidneys. Culinary Uses: Primarily a French and European spice. Technically Fenugreek is a legume, so caution should be used for those with sensitivities. Therapeutic Properties: Mucolytic, anti-inflammatory, antimicrobial, antifungal. Helps with baldness, cancer, elevated cholesterol levels, and diabetes. Culinary Uses: Basic spice used in all dishes. Therapeutic Properties: Antibacterial, antiamoebic, antimicrobial, antiviral, antifungal. Helps with hypertension and low blood pressure, stimulates the digestive system, circulation, and helps to prevent cancer and heart disease. Culinary Uses: Indian, Asian, Cajun, and Jamaican dishes. Also used for tea. Therapeutic Properties: Aphrodisiac, analgesic, stimulates and normalizes digestion. Helps with stomach and digestive problems, flatulence, constipation, sexual fatigue, morning and motion sickness, stabilizes after emotional upset, and warms the lungs and bronchi. Culinary Uses: Used mostly in Thai dishes. Therapeutic Properties: antiviral, anti-inflammatory, sedative. Room freshening. Culinary Uses: Used in many type of dishes ranging from Mexican to Italian. Used in tomato based dishes. Similar to Oregano. Therapeutic Properties: Antibacterial, antiviral, neurotonic, helps with whooping cough, conditions of the respiratory tract and nervous system, reflux, and flatulence. Culinary Uses: German and Slavic Dishes. Therapeutic Properties: Antimicrobial, antiseptic, diuretic. Aids in digestion, promotes appetite, helps with colds, chills, coughs, rheumatism, arthritis, and general aches and pains. Culinary Uses: Basic dessert and beverage spice. Used in Italian cheese dishes. Therapeutic Properties: Antiviral, nerve tonic. Helps with general weakness, dyspepsia, sluggish digestion, rheumatism and pain. Culinary Uses: Basic spice used in all dishes. There are many different types of onions including green onions, Leeks, Yellow Onions, White Onions, Sweet Vidalia Onions, and Red onions. Therapeutic Properties: Antimicrobial, antiseptic, antispasmodic, antiviral, antibacterial, antifungal. Helps to cleanse blood and improve circulation, soothes nerves, helps to sleep, and cleanses the air. Culinary Uses: Used in many type of dishes ranging from Mexican to Italian. Used in tomato based dishes. There are many types and flavors of Oregano. Therapeutic Properties: Antiviral, antibacterial, antiparasitic, antifungal. Helps to strengthen the spleen, with viral, bacterial, and respiratory infections, and with immune deficiency. Culinary Uses: Primarily used as garnish, but also used in Mediteranean dishes. Therapeutic Properties: Breath freshener and a natural source of carotene, vitamins B1, B2, C, Iron, and other minerals. The oils from the seeds are digestive stimulants and diuretics, but it is also known to be a uterine stimulant and is considered too strong for medicinal use. Culinary Uses: Basic dessert herb. Also used as a tea. Therapeutic Properties: Analgesic, anti-inflammatory, antimicrobial, antiviral, antiseptic. Liver stimulant, spasmolytic, cooling, refreshing. Helps with liver deficiency, travel sickness, nausea, PMS, allergies, bad breath, lack of concentration, muscle spasms, injuries, and headaches. Culinary Uses: Dried slightly ground peppers and used in Mexican, Latin, and Southwestern dishes. Can be added to soups, sauces, or used as a garnish. Culinary Uses: Used in many dishes, but primarily used for seasoning meats and poultry. There are several different types of Rosemary. Therapeutic Properties: antiviral, mucolytic, decongestant, expectorant. Helps with cell regeneration, liver and gall bladder stimulant, supports the circulatory system, relieves bronchitis, sinusitis, rhinitis, flu, common cold, and is used in skin and hair care. Culinary Uses: Used in many dishes, but primarily used for seasoning meats and poultry. Therapeutic Properties: Expectorant, mucolytic, antibacterial, antiviral, cell regenerating. Helps with bacterial and respiratory infections, gum ulcers, and skin regeneration. Also helps with Insomnia. Culinary Uses: Used in many dishes, but primarily used for seasoning legume dishes. Therapeutic Properties: Strongly antibacterial, antiviral, antifungal, antiparasitic, and immune stimulating. Helps with Severe bacterial bronchitis and lung infections, nervous fatigue, and deficient spleen. Culinary Uses: Basic Spice used in all dishes. Caution should be used if cardiovascular problems are present. Therapeutic Properties: Salt has no real medicinal properties. While it is required for cell metabolism within the human body, it is fairly recent in human history that we began adding salt to our food. We do not need more than what comes naturally in our food. Use this spice sparingly, if at all. Do not add salt to food after it is on your plate. It can cause severe cardiovascular problems and congestive heart failure. Culinary Uses: Used in Desserts primarily and to sweeten soups and sauces. Therapeutic Properties: Provides equilibrium to the Autonomous Nervous System, relieves headaches, PMS, stagnation of liver and digestive tract, and helps with irregular heart beat and breathing. Also helps with muscular aches and pains, rheumatism, bronchitis, colic, and indigestion. Therapeutic Properties: Spasmolytic, neuro-stabilizing, anti-inflammatory. Helps with nervousness, shock, PMS, and nausea. Culinary Uses: Used in many dishes, but primarily used for seasoning meats and poultry. Used in Italian and tomato based dishes. There are many different types of Thyme. Therapeutic Properties: Antibacterial, antiviral, antimicrobial, antifungal, neurotonic. Helps with viral and bacterial infections, Candida Albicans, skin care, bronchitis, sinusitis, rhinitis, flu, common cold, chronic infections, chronic fatigue, liver regeneration, depression, and several STD infections. It is an immuno-stimulant and helps with overall strengthening. Culinary Uses: Used in desserts and beverages. Therapeutic Properties: There is no specific medicinal quality…but it does make everyone happy when it is used for flavoring! Herbs and Spices are Nature’s Medicine Cabinet.